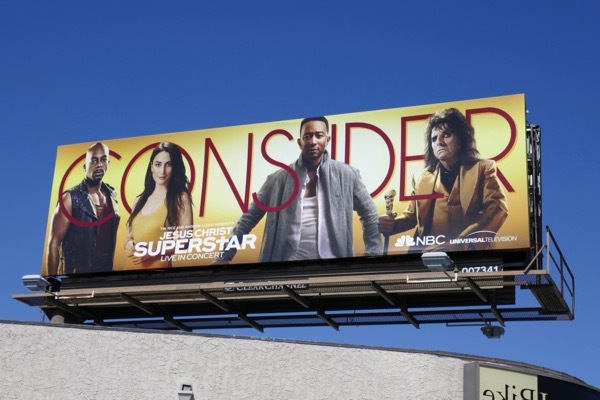 The Emmy consideration billboards keep coming in the skies of L.A. this month, but this year to help stand out NBC has a cohesive 'Consider' campaign to shine a spotlight on its shows and talent. 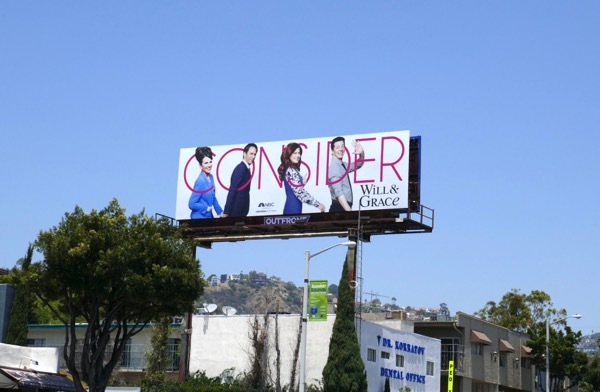 The bold campaign design involves the Consider lettering in the background and the show's stars in the foreground, like with this example for the revival of their hit sitcom, Will & Grace. 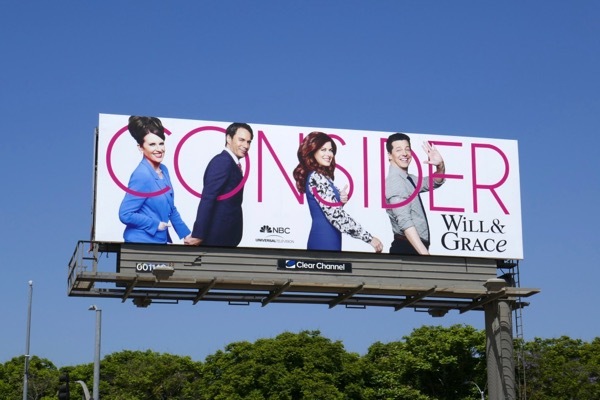 These eye-catching Will & Grace Emmy consideration billboards, featuring Megan Mullally, Eric McCormack, Debra Messing and Sean Hayes, were snapped along Olympic Boulevard and Fairfax Avenue on June 1, 2018. In it first eight season from from 1998 to 2006 the groundbreaking LGBT sitcom scored 83 Emmy nominations and took home sixteen awards in total, so can this newly revitalised ninth season earn them some more. 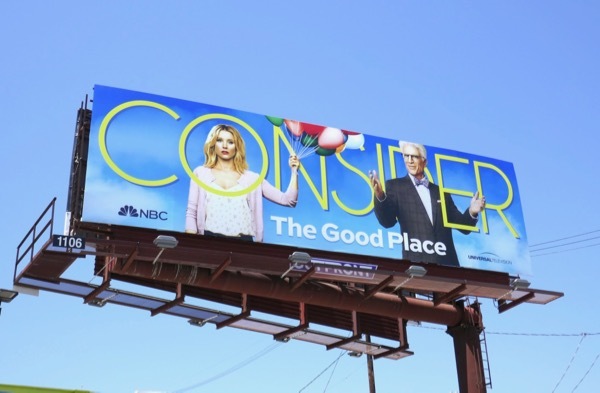 Also in the world of comedy NBC was hoping that TV Academy voters would reward its heavenly sitcom, The Good Place, for a hell of a great sophomore season. 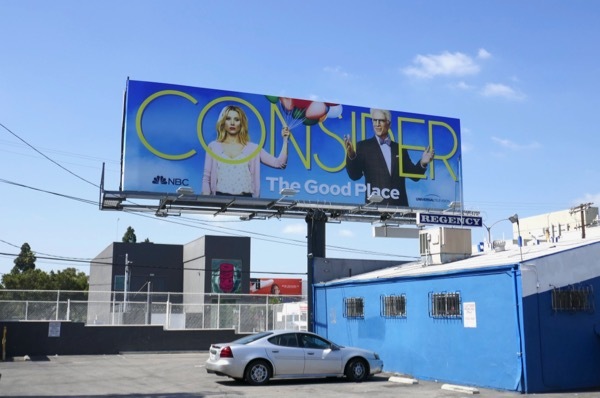 Last year it was a forking tragedy when Kristen Bell and Ted Danson's comedy was shut out of the nominations, so let's hope people see sense this year, otherwise they're all going to be sent to The Bad Place. 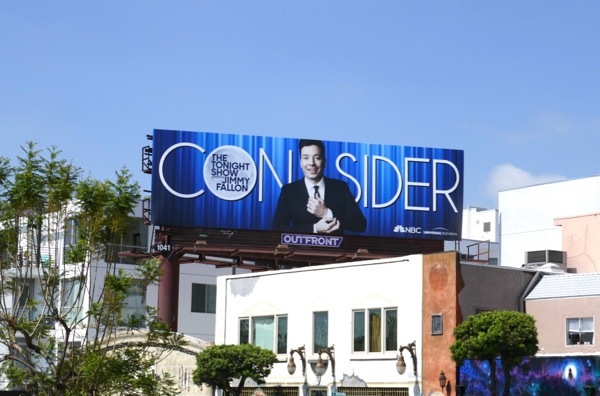 This fun Emmy consideration billboard was first spotted along Fairfax Avenue on May 30, then later along Santa Monica Boulevard on June 1, 2018. The Trump presidency may be disastrous for the world and your mental health, but it's been a blessing for late-night comedy and variety sketch shows, like the long-running Saturday Night Live. She may not be playing Hillary Clinton as much in this forty-third season, but Kate McKinnon's impersonations of political figures like Jeff Sessions, Kellyanne Conway, Rudy Giuliani, to name but a few, are a delight to behold. That's not to discount the rest of the SNL cast like Cecily Strong as Melania Trump, Leslie Jones as Omarosa and Aidy Bryant's Sarah Huckabee Sanders are also laugh-out-loud funny (the male cast members are okay too). 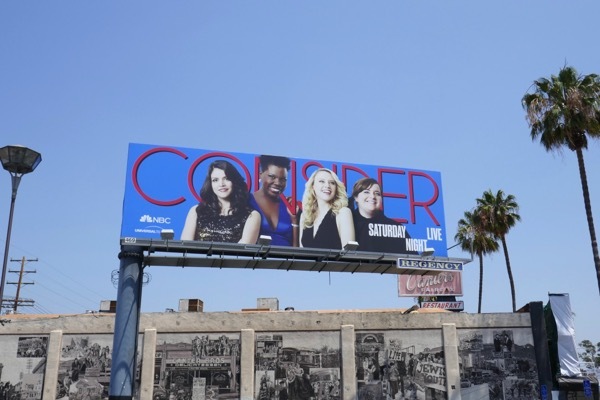 This Consider billboard for Saturday Night Live was photographed along Fairfax Avenue on June 6, 2018. Even with a whopping 221 nominations and 54 Emmy wins, is it greedy for them to want more, even if they're more than deserved? 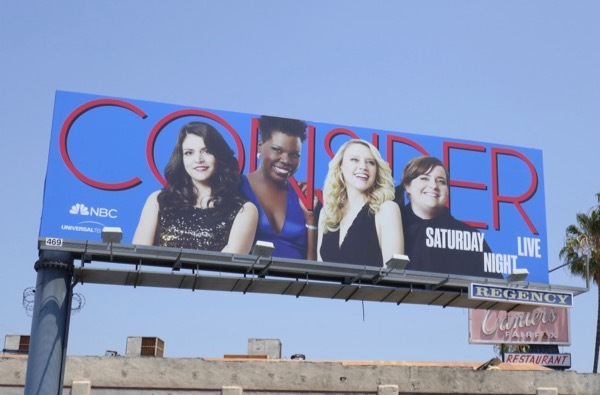 Here's also an Emmy consideration billboard for Universal Television's Unbreakable Kimmy Schmidt which is back with the first half of her binge-worthy fourth season on Netflix this month. 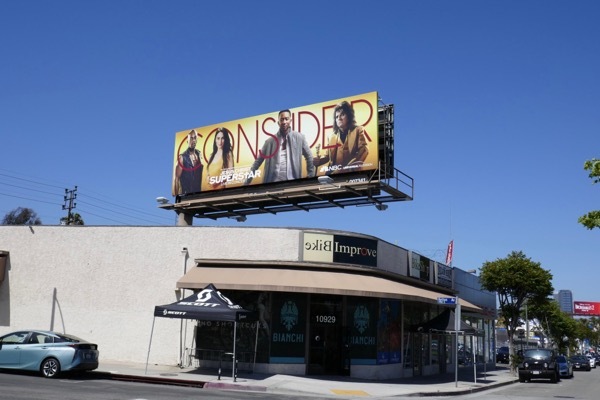 This Consider billboard for the quirky comedy starring Ellie Kemper, Tituss Burgess, Carol Kane and Jane Krakowski was spied along Fairfax Avenue on June 1, 2018. With sixteen nominations to date and no wins, will this year be lucky for the comedy series? 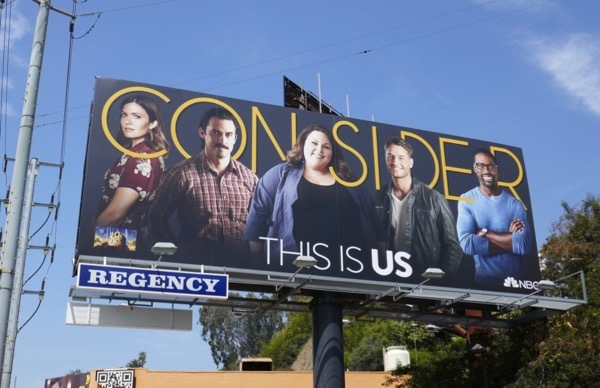 Dan Fogelman's tearjerking, time-hopping family drama, This Is Us, garnered ten Emmy nominations for their debut season, but will the 'Pearsons' and the people that play them continue to excite critics for their sophomore year, especially now we've learned how Milo Ventimiglia's patriarch, 'Jack', died (damn that Crock-Pot). 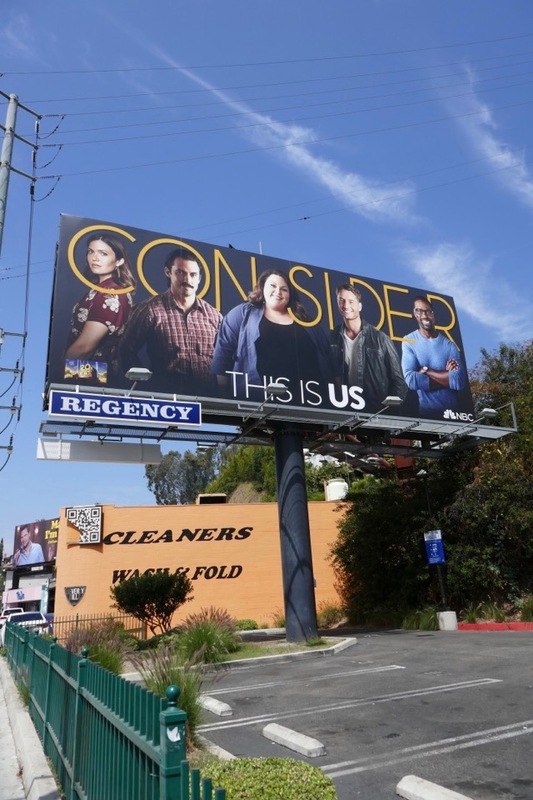 This Consider billboard featuring Mandy Moore, Milo Ventimiglia, Chrissy Metz, Justin Hartley and Sterling K. Brown was spotted along the Sunset Strip on May 29, 2018. Seth Meyers may have hosted the Emmys back in 2014, but his show Late Night with Seth Meyers has only earned one nomination for writing last year, so can the former SNL comedian garner more nods this season? 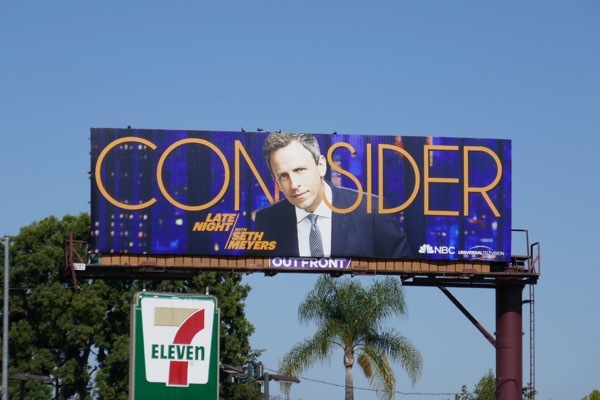 Maybe this Emmy FYC billboard spied along along Highland Avenue on June 4, 2018, will help. 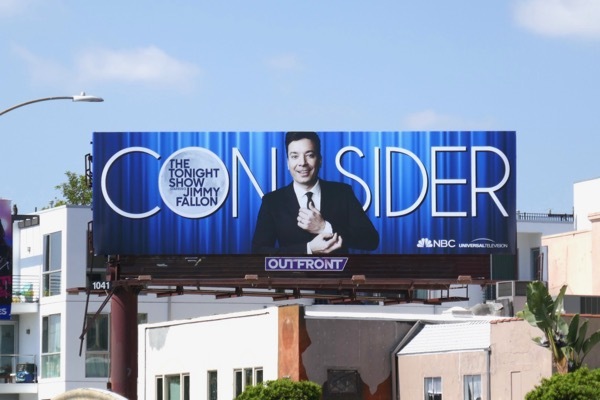 The variety talk series category is a competitive one, just look at all these 2018 late-night Emmy FYC billboards, so let's see if The Tonight Show starring Jimmy Fallon will be a hit this year for NBC. Another Saturday Night Live cast member, who occasionally moonlights as Jared Kushner on the show, has hosted this long-running talk show since 2014 and has been struggling in the ratings of late thanks to fierce competition from his rivals like Stephen Colbert. So let's see if this Consider billboard spotted along Fairfax Avenue on June 1, 2018, will help encourage votes. NBC has become known for its live broadcast stage spectaculars in recent years and this Easter saw rock opera Jesus Christ Superstar Live in Concert on the small screen, with an all-star cast including John Legend, Sara Bareilles, Brandon Victor Dixon and Alice Cooper. 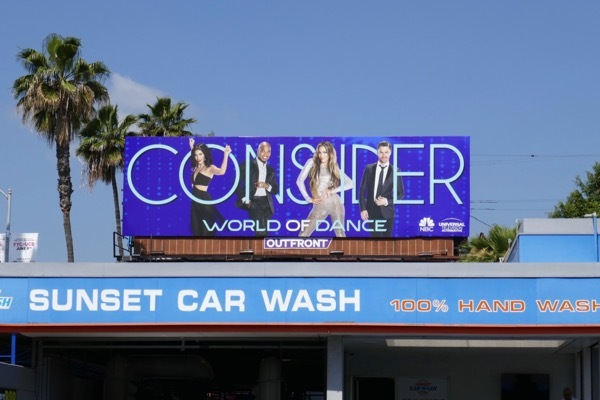 Can this musical event garner some Emmy nominations beyond the creative arts this season with the help of this vibrant yellow Emmy FYC billboard spied along Santa Monica Boulevard on May 29, 2018. 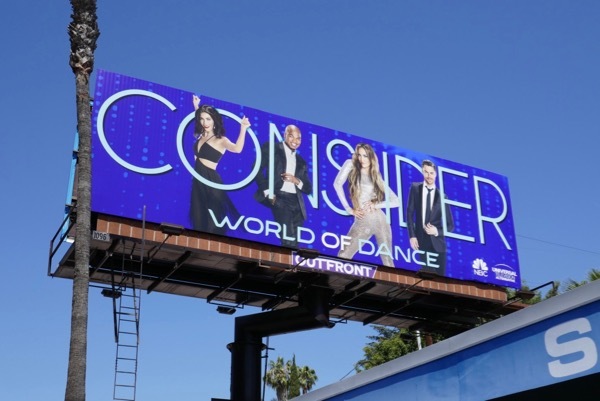 And finally for this collection of FYC outdoor ads, here's a billboard (captured along Sunset Boulevard on June 1, 2018) to encourage voters to consider NBC's global dance competition, World of Dance, and its host Jenna Dewan and judges Ne-Yo, Jennifer Lopez and Derek Hough. Let's see if this coordinated approach to the Emmys will help NBC score big when the coveted nominations are announced live on July 12, 2018. 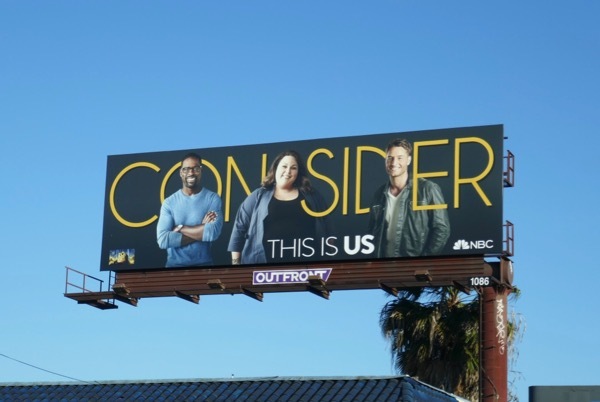 UPDATED: Here's also another 'Consider' billboard for the adult 'Pearson' siblings from This Is Us, spotted above La Cienega Boulevard on June 12, 2018. 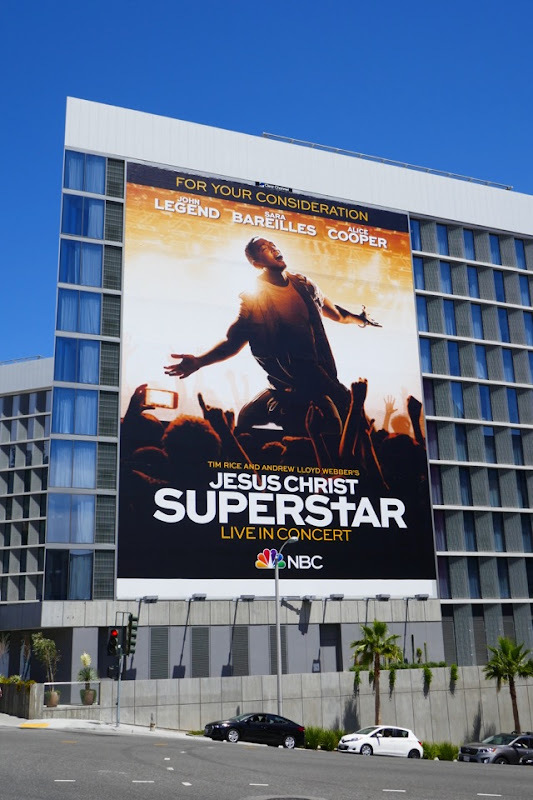 UPDATED: The Jesus Christ Superstar special is also getting some super-sized support this Emmy season with this FYC billboard spotted along the Sunset Strip on June 15, 2018. 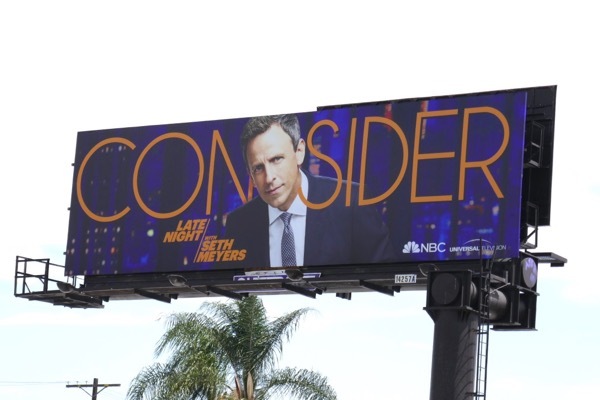 UPDATED: Here's a better version of the Seth Meyers 'Consider' billboard spotted along Ventura Boulevard in Studio City on July 2, 2018. 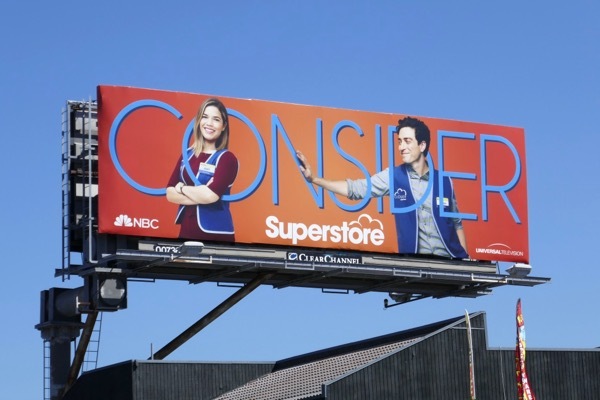 UPDATED: Here's also another 'Consider' billboard for the third season of the workplace comedy Superstore, starring America Ferrera and Ben Feldman, spotted along Overland Avenue on July 22, 2018.